San Jose, CA – November 12, 2018 –Angie Hospitality, developer of the world’s first voice and AI solution purpose-built for the hospitality environment, announces the successful completion of a certified integration with the HotSOS platform of Amadeus Hospitality, a leading provider of advanced technology solutions for the global travel industry. As a result of this certification, hoteliers will now be able to fully integrate Angie’s digital guest room assistant with HotSOS, one of hospitality’s most utilized cloud-based service optimization enterprise solutions. While maintaining Angie’s full suite of features designed to enhance revenue, guest satisfaction and operational efficiency, the new integration with HotSOS provides several unique advantages that allow hoteliers to further differentiate themselves from competing properties. This includes the ability to implement the automated dispatch of guest requests and dramatically reduce wait times, while also minimizing the number of employees or other resources needed in order to complete a task from start to finish. In addition to increasing guest convenience, hotel staff members are also able to leverage the integration to remotely connect with and manage departments via Angie’s voice or touchscreen. This allows staff to update room status and service requests, as well as alerting other employees or departments of guest requests, incidents or service delays in real time. Angie’s voice-activated capabilities also include remotely controlling room amenities, such as lighting, thermostats and guest room televisions. The cost-effective all-in-one guest room device also functions as a telephone, alarm clock, night light and Bluetooth speaker, among other things. Angie can also operate as a secure Wi-Fi access point, offering guests a fast and fully-encrypted internet connection. Guests can easily personalize the in-room network, so their devices connect as they do at home, and preferences can be remembered for future stays. About Angie Hospitality |Angie Hospitality, founded by hospitality industry veterans, is the developer of the first 24-hour interactive guest room assistant, purpose-built for the hotel environment. The 2017 HTNG TechOvation Award winner, Angie is the world’s first enterprise-class, cloud-managed platform built on a secure, scalable and highly-available architecture that is continuously monitored, allowing the system to self-configure for each property and room as soon as Angie is plugged in. 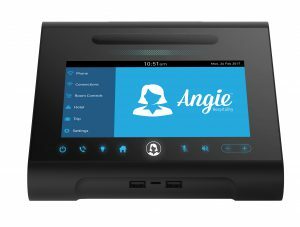 Angie provides access to hotel information and amenities with voice or touch screen, as well as charging and Bluetooth speakers for mobile devices, and also offers configurations to provide secure Wi-Fi, room control and IP telephony. For more information on Angie Hospitality, please visit angie.ai and connect with us on Facebook, Instagram, Twitter, LinkedIn and YouTube.